The station is unique as very early on in its design inception a request was made by the St Michael’s Ward Committee for the provision of a public meeting room. Due to the urban sprawl of very poor housing in this area no such facility existed. To save costs some the bricks salvaged from the building site on clearance were utilised for the Free Library in Harpurhey and the remainder were used for the actual build. It had become desirable by the 1870's to increase local but suitable recreation for the working class and council land was sought out for this purpose. Of many plots considered the provision of a small recreation ground locally alongside the station was agreed. This was provided even though two of Manchester’s and England’s first and largest public parks were situated within a mile at Phillip’s Park [opposite the Etihad Stadium 2012] and the Queen’s Park in Harpurhey just north of Queen’s Road. 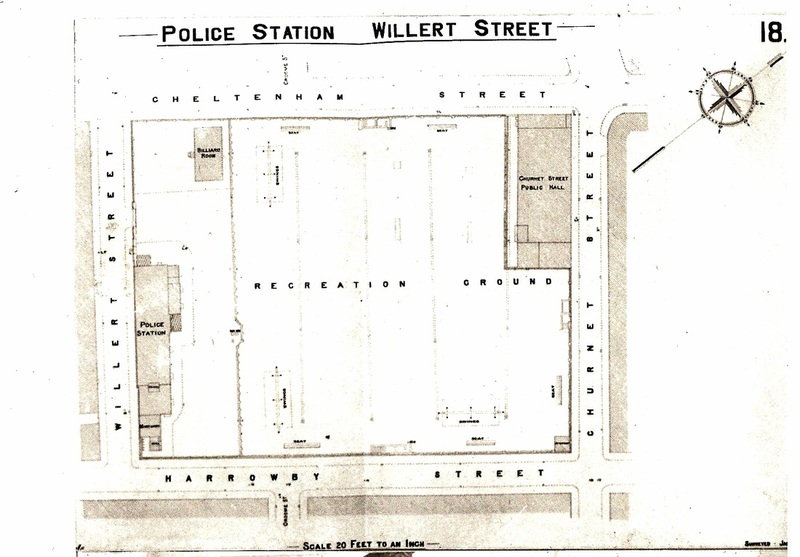 The plan of the Willert St complex reveals that three quarters of the very large plot was taken over by the recreation ground with Willert Street Police Station controlling a narrow strip along the entire street. Due to increased public health demands by the 1870's a mortuary was built into the design of the station. Of note is that the entrance was directly behind the swings in the park as seen by the photograph of the mortuary in 1939. The Station was first referred to as Groome St or Churnett Street due to the surrounding roads, but by 1877 on its opening the side street is renamed Willert Street after the senior member of the Watch Committee - Alderman Willert. He died in 1879. The meeting rooms take on the name of Churnett St at the opposite end of the plot. The building tender from Mr Hershaw was initially £7,364 and by 1886 the station and fittings were valued at £10,682. A comprehensive list of all the Watch Committee minute entries for the station from the last quarter of the century has been attached below. The Station was in service right up to the 1970’s but was then demolished to permit the redevelopment of the whole area with modern council housing. May 16th 1872 Another station required btw Livesey St and Harpurhey for a station house and drill yard. Oct 24th 1872 LUSC to locate site btw Rochdale Rd – Oldham Rd 250yds from Collyhurst St from Mr Hershaw for £3,667.2.6d. Nov 21st 1872 St Michael’s ward Committee request large room for public meetings within new station. Request for a portion of the building materials (from site clearance) for the erection of the new Free Library near Harpurhey. Dec 31st 1873 The Treasurer of the Committee reports he paid £20,000 into the ‘New Stations Account' of the LUSC. Feb 19th 1874 B Div Sub Station Groome St Rochdale Road to prepare new plans. Oct 22nd 1874 Tenders received Mr S Warburton £7,634 cheapest and approved. Jan 20th 1876 Building delayed due to street works but now 3/5th complete. March 23rd 1876 LUSC request the condition of the streets around Churnett St.
Sept 27th 1876 Repairs to Groome St and Albert St yard by paving. 22 Feb 1877 PS Groome St Mr Warburton completed same in Nov 1876 but delays in paving outside his control. Seeks final payment of £1,600 with £50 retention for defects. ‘ Want of additional police accommodation in that district has long been felt by the police who in the conveyance of prisoners...are roughly handled by persons anxious to rescue the captives’. 2 Aug 1877 Recommend to call street in front of new station ‘Willert Street’ [After Alderman Willert of the W.C who dies later in 1879. 29 Sept 1877 HMIC Inspection report: Sub-station has been completed and contains, charge room, offices and 6 cells for prisoners, and a large drill-ground attached. 4 April 1878 New station requires 6 officers under an Inspector. 9 Oct 1879 Repairs to defect roof flashing and gutters. May 23rd 1889 Income Tax demand for inhabited station for £250. Appeal in law lodged as exempt and later Surveyor of Taxes withdraws demand. Jan 8th 1891 Alterations to tenders now £73. April 30th 1891 Painting of the stations: £69. July 23rd 1891 Twinquennial valuation of properties owned by the W.C only: £11,252. Feb 4th 1892 A hut required in yard of Willert St to house the Sanitary Insp. as complaint from officers that he is bringing disease back to Crumpsall St on his 12pm visit. Risk denied by the Medical Officer of Health for W.C.
17th Oct 1893 A resolution to approve an application by the Independent Labour Party of North Manchester to hold a meeting in the yard at Willert St PS, was carried by eight votes to seven. 21st May 1896 LUSC report: to abolish the present closet and ash pan in the lavatory adjoining the charge office and connect it to the small room [lavatory system]. The two windows in the tailor’s room on the first floor to have the sills lowered to improve the light on the cutting table. 15th May 1901 Quinquennial Valuations: £11,844.